NewsOnF1.com offers you Formula One Grand Prix tickets to the 2012 Canadian Grand Prix. Please note that the handling fee and the shipping charges are added at checkout. Tickets will be shipped via International Courier service approximately 3 to 4 weeks prior to the event. Insurance to the value of the tickets purchased. One child aged 11 and under, if accompanied by an adult holding a General Admission ticket, will be given access to the site free of charge however a Child ticket must be issued. Please request one with your order. In 1982 the Canadian Grand Prix circuit was renamed in honour of Gilles Villeneuve, the very popular Canadian driver, who died during practice for the Belgium GP that year and who had won the first F1 race held on the Ile Notre Dame circuit in 1978. Because of its excellent infrastructures, it is a popular event on the Formula One calendar. 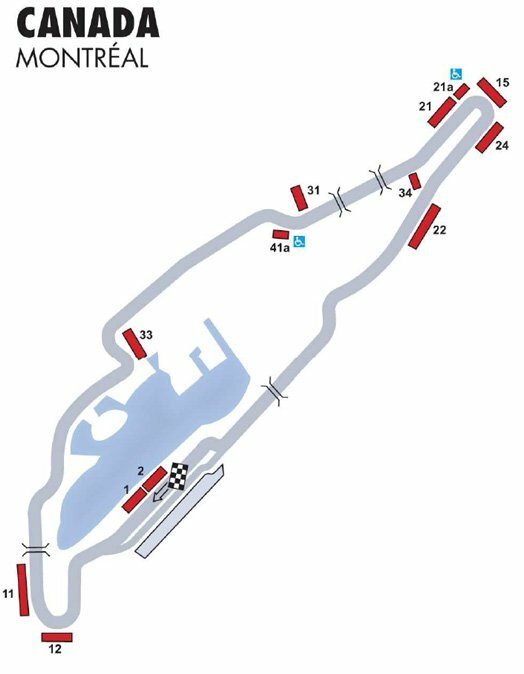 The Canadian Grand Prix track is a mix of slow and rapid corners with a very long straight which demands a lot of the engines. But its layout is popular with the drivers because it is one of the few GP tracks where overtaking is possible, and the annual stopover in Canada remains one of the most popular with the F1 circus. The track has been modified a few times in the past, involving minor reprofiling of some corners on safety grounds. We also offer tickets to the 2012 Canadian Grand Prix from alternative suppliers. Click here to purchase from our supplier in the UK or here from our supplier in Europe.